The Energy Information Administration (EIA) just released an early version of its Annual Energy Outlook (AEO) 2016, providing two cases—one incorporating EPA’s so-called Clean Power Plan (CPP) and one without it. [i] IER posted a blog yesterday that detailed the results of these two cases for the electric sector. Despite reduced coal generation due to onerous regulations by the Environmental Protection Agency (EPA), government subsidies and state mandates for renewable fuels, and low natural gas prices, fossil fuels (natural gas, oil, coal) still dominate the energy demanded by Americans, supplying 81 percent of U.S. energy consumption today and 77 percent in 2040. In this forecast, domestic production of petroleum and other liquids increases as crude oil prices rebound. Consumption of petroleum and other liquids remains relatively flat as decreases in transportation consumption offset increases in industrial consumption. With increasing production and flat consumption, net petroleum imports drop to 7 percent in 2040 in the case with the CPP from 24 percent today and 60 percent in 2005. Transportation sector energy consumption is expected to decline over the forecast period, which differs markedly from history where the average annual growth over 1973 to 2007 period was 1.3 percent. Offshore production in the lower 48 is less sensitive to short-term price movements than onshore production due to long investment time frames. 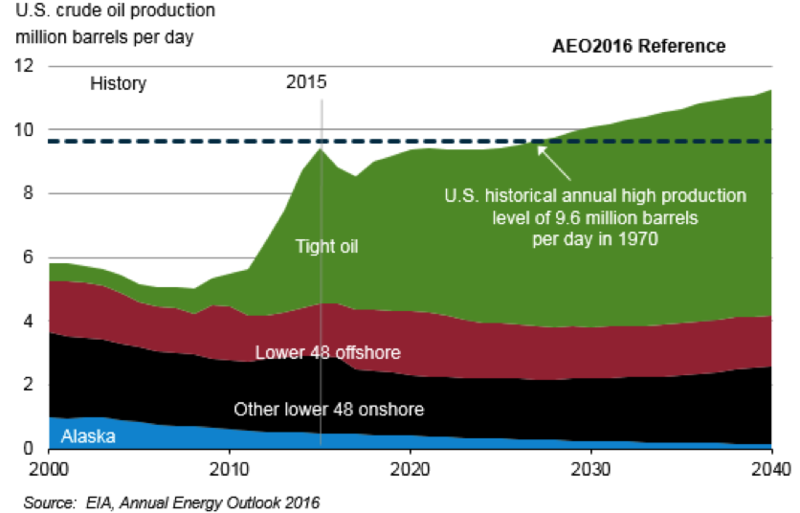 Lower 48 offshore crude oil production is expected to increase to 2.0 million barrels per day in 2021 and then decline to about 1.6 million barrels per day in 2030 and remain relatively flat through 2040. Onshore and offshore production in Alaska is expected to decline through 2040, from about 0.5 million barrels per day in 2014 to under 0.2 million barrels per day in 2040, calling into question the viability of the Trans Alaska Pipeline System (TAPS). The two main sources of future liquid fuels production growth include tight oil and natural gas plant liquids. 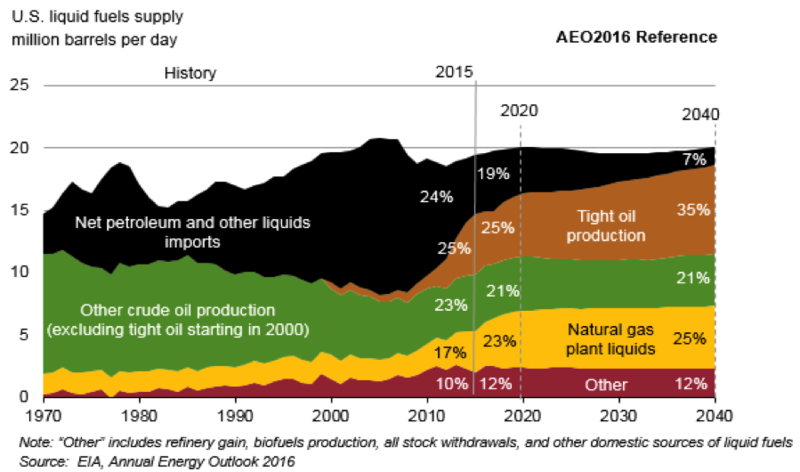 Tight oil production increases from 25 percent of total U.S. liquid fuels supply in 2015 to 35 percent in 2040. Natural gas plant liquids production increases from 3.3 million barrels per day in 2015 (17 percent of total liquid fuel supply) to 5.0 million barrels per day in 2040 (25 percent of total liquid fuel supply). Total petroleum product exports, particularly of distillates and hydrocarbon gas liquids, are expected to continue to grow as increasing domestic crude oil and natural gas liquids production support continued favorable economics of U.S. petroleum product supply. This continues the trend of total petroleum product exports that increased rapidly over the 2008 to 2015 period, reaching 4.8 million barrels per day in 2015. Natural gas prices are expected to remain below $5 per million British thermal unit (Btu) through 2040. The Henry Hub spot price for natural gas averaged $2.62 per million Btu in 2015, the lowest annual average price since 1995. Despite the low price, production gains continued as a result of abundant domestic resources and improved production technologies. Natural gas prices are expected to rebound from their 2015 levels, increasing above $4.40 per million Btu by 2020 (an average increase of 11 percent annually). The price increases are the result of increased demand, notably for liquefied natural gas (LNG) exports from projects that are already under construction. After 2020, natural gas production, end-use consumption in the industrial and electric power sectors, and exports of LNG are projected to increase. However, technology improvements, which result in drilling cost declines and increased recovery rates, allow productive capacity to keep pace with demand, resulting in stable prices the rest of the projection period. 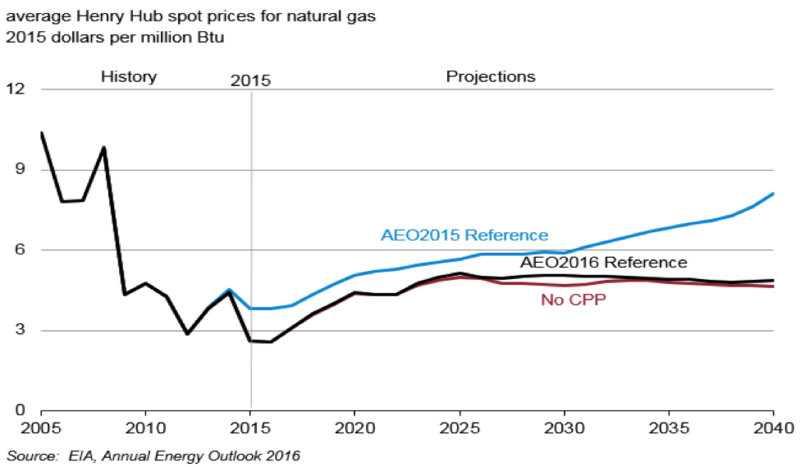 In the case without the CPP, less demand for natural gas from the electric sector and more coal-fired generation results in lower average annual U.S. natural gas prices at the Henry Hub over the 2022 to 2040 period. Natural gas production is expected to exceed consumption in the near future, making the U.S. a net exporter of natural gas. The growth in natural gas production is driven by the continued development of shale gas resources where technology improvements result in higher rates of recovery at lower costs. Natural gas production is expected to increase at an average annual rate of 1.8 percent between 2015 and 2040. Growth in natural gas production keeps natural gas prices from increasing above $5 per million Btu, stimulating demand for natural gas in the United States (particularly in the electric power sector) and in overseas markets. In the case with the CPP, total natural gas consumption grows by 0.9 percent per year between 2015 and 2040, but decreases between 2017 and 2021 due to a decline in the electric power demand when renewable energy begins to dominant capacity additions. 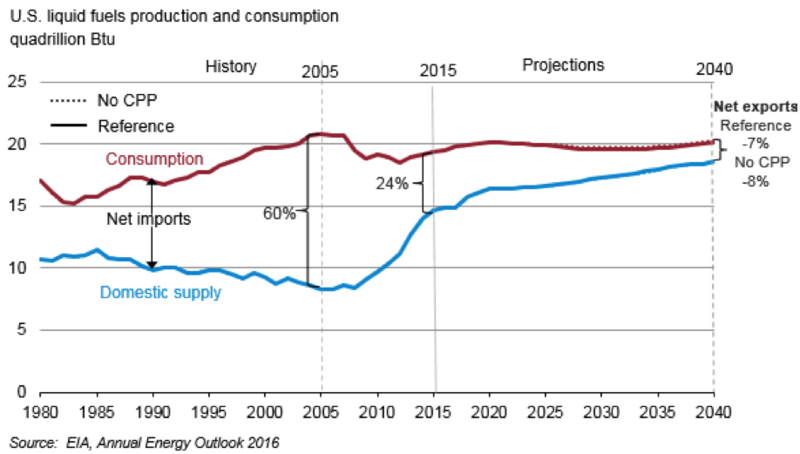 After 2021, natural gas consumption rises steadily. Shale gas is the dominant source of production growth in natural gas. Dry natural gas production is projected to increase by 55 percent between 2015 and 2030 due to the development of shale gas and tight oil plays, tight gas, and offshore gas resources. 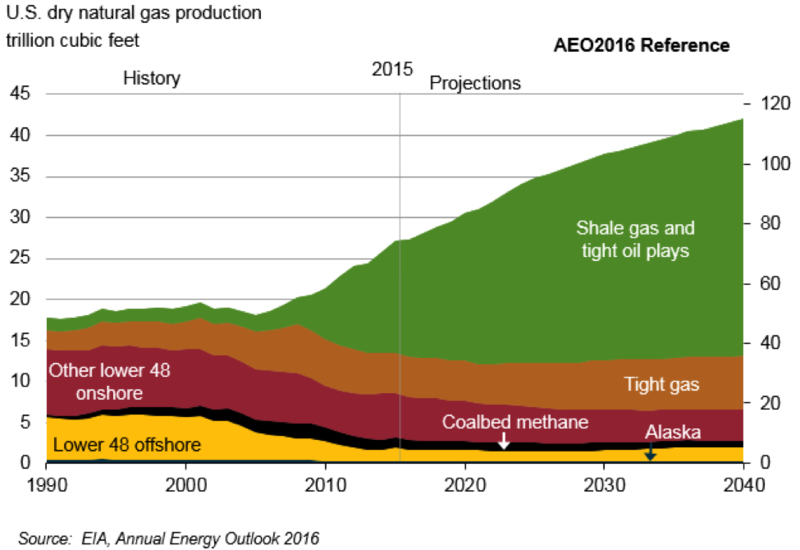 Production from shale gas and tight oil plays increases by more than 15 trillion cubic feet over the 2015 to 2040 period, reaching 29 trillion cubic feet in 2040. The shale gas and tight oil play share of total U.S. dry natural gas production increases from 50 percent in 2015 to 69 percent in 2040. Tight gas production growth occurs in the sedimentary basins located in the Dakotas/Rocky Mountains and Gulf Coast regions. Offshore natural gas production averages around 1.5 trillion cubic feet through 2020 before declining due to declines in legacy offshore fields. After 2027, offshore natural gas production again increases as production from new discoveries more than offsets the decline in legacy fields. The United States remains both an importer and exporter of natural gas over the projection period, but becomes a net exporter in 2018. 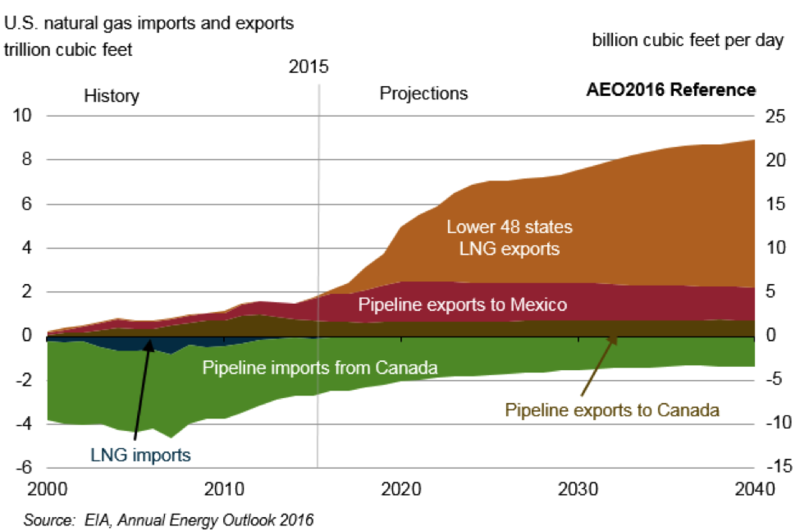 Natural gas imports into the United States are expected to drop by 49 percent between 2015 and 2040 while natural gas exports from the United States, both by pipeline and LNG, grow over five-fold. The initial rapid growth in exports is due to the five LNG export projects currently built or under construction in the Mid-Atlantic and the Gulf Coast regions, with capacity to export 2.9 trillion cubic feet per year. 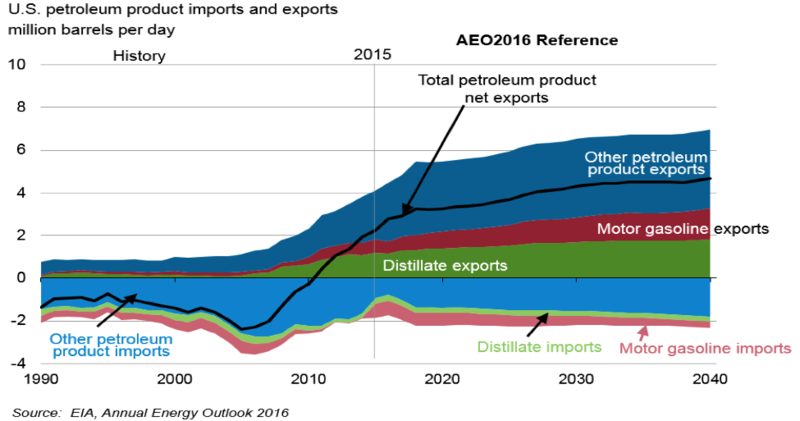 Additional facilities are expected to be built to accommodate LNG exports of 6.7 trillion cubic feet in 2040. U.S. natural gas exports to Mexico by pipeline will continue to increase in the near term to meet Mexico’s increasing demand for natural gas, particularly in the electric power sector. The growth in near-term consumption will be met by several pipeline projects currently under construction. After 2020, however, U.S. pipeline exports to Mexico gradually decrease, reflecting the initiation of new oil and natural gas production projects in Mexico. U.S. net imports from Canada continue to decline as relatively low prices make natural gas produced in the United States more competitive. EIA has made major changes to its forecast with the incorporation of subsidies and lower costs for renewable fuels and with the regulatory changes of the Obama Administration, including the Clean Power Plan. Despite these changes, the United States is expected to rely on oil, natural gas, and coal for 77 percent of its energy needs by 2040. 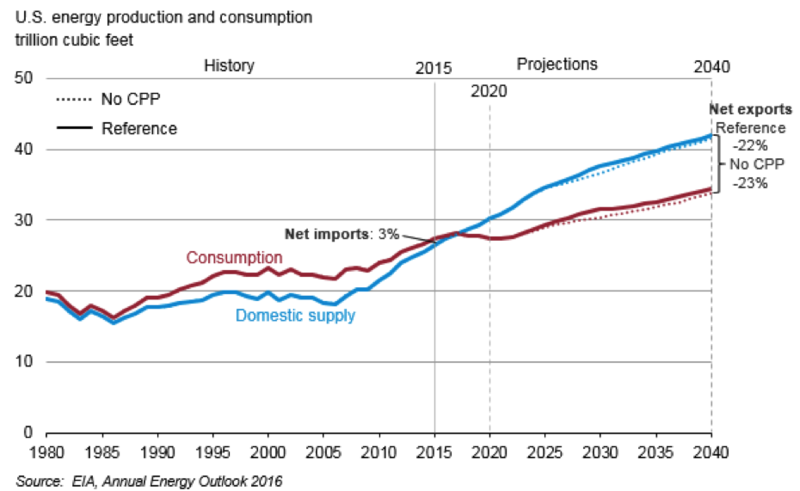 EIA sees the energy renaissance continuing with the United States becoming a net exporter of natural gas by 2018 and net oil imports declining to 7 or 8 percent in 2040, depending on the case.